Yes, I was in Wal-Mart again this evening – almost starting to feel like I live there. I was getting some more FREE L’Oreal Man Expert shaving cream in trial sizes. Thankfully Wal-Mart is close to my house. I don’t wanna clear the store all in one go so I have been going back to get 5-6 every couple days. They seem to keep re-stocking too so that is nice. Tonight I picked up 6 of the trials sizes and two of the regular ones. I decided it was best to get 1 regular size for every 3 trial sizes to use the overage. Some of my overage even covered some of the tax – was surprised to see that, guess I miss judged how much I was going to have. This is my highest savings yet. I honestly didn’t think I would see a savings higher then 89% because of tax, unless of course I was getting a tax free item. I didn’t even think that overage would apply to tax. I also got a couple things in the mail from brandSAVER – it was the same as a got last week – but no shaver, not sure where this one came from. An accidental duplicate or if this or the other one was the Costco one… no idea, but free is free! It had some single use packets of dawn, gain and toothpaste. As well as a two pack of Cascade Allin1 Packs. There was also some Crest and Pantene coupons. 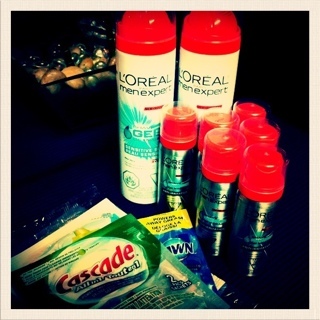 This entry was posted in canadian coupons, coupons, freebies, mail, samples, walmart and tagged canadian coupons, coupons, free, free samples, freebies, mail, overage, walmart on November 14, 2011 by Courtnie.